One of the best parts of my job as a teacher of English as a Second Language is working with one kindergarten class during Writing. (Kindergarteners really can write, by the way.) In the nonfiction unit in our writing curriculum, there is a trade book titled, Mr. Santizo's Tasty Treats. The book describes a baker who lives in Chicago and bakes cakes, breads, and cookies in a bakery. At the end of the book is a recipe for Mr. Santizo's chocolate chip cookies. I made the cookies last year and was not too impressed with the results. The recipe called for a pound of butter, four eggs and four cups of flour, but only 2 cups of sugar, half a teaspoon of vanilla, 1/4 teaspoon of salt (no baking soda). So this year, I upped the sugar, salt, and vanilla to what I thought were reasonable measurements. The cookies tasted waaaaaay better this time around, but the texture and appearance are still off, as far as I'm concerned. I've decided that the baking soda adds a deeper brown color. The texture when you eat these cookies is pleasant enough. Chewy. But the feel of them on my fingers was almost plasticky. Yeah. Strange. 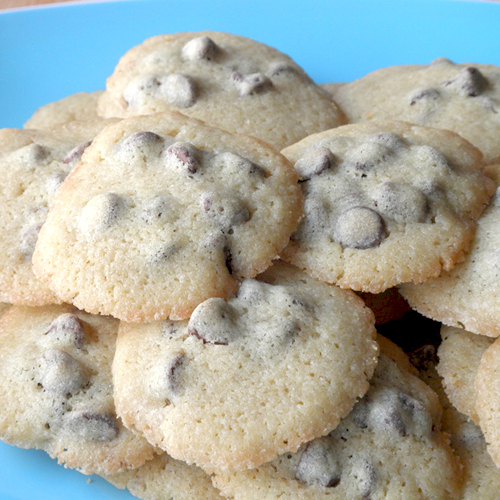 Anyway, if you like rubbery chocolate chip cookies, this might be the recipe for you. I'm posting it because I made it, and because the kindergarteners loved them. I got lots of thank you hugs today, and that alone is worth posting about. I love my job, maybe even more than Mr. Santizo the baker loves his. Cream butter and sugar. Mix in eggs. Add vanilla & mix well. Slowly add flour that’s been mixed with salt into the butter, sugar, egg, vanilla mixture. Make 1-inch size balls and place on ungreased cookie sheet.